What do Kenya, Georgia and Ecuador have in common? These 3 countries are among those having successfully deployed secure excise tax stamps programs powered by SICPA technologies and are extensively mentioned in this just published, must-read World Bank report. 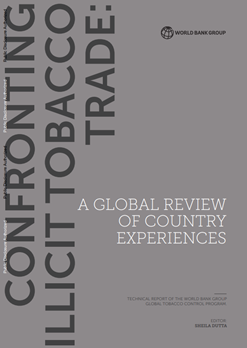 While reviewing country-specific experiences in confronting illicit tobacco trade, the 706-pages report gives strong arguments in favour of secured traceability solutions. It also highlights the leading role SICPA plays in this area, including detailed technical description of the solutions deployed. Deploying secure excise tax stamps and other product markings to facilitate enforcement and tax collection. Establishing effective track-and-trace systems to follow tobacco products through the supply chain from production of import to sale to consumers. Deploying effective enforcement teams equipped with automated reporting devices, to reduce human discretion in tobacco tax administration. This feature played a major role in improving the level of enforcement in Kenya and Georgia. The report also underlines that while secure excise stamps plays a crucial role, they should be deployed in conjunction with downstream verification confirming that cigarettes packs have tax stamps and are authentic so as to prevent tax evasion. [...] Implementing the EGMS turned out to be cheaper than the cost of the previous system. The implementation of the EGMS has led to an increase in tobacco tax revenue. Overall, 2014 tax compliance expanded by 45 percent, while costs went down. The KNBS reported a 76 percent increase in legitimate cigarette and cigar sales from 2013 to 2016, which is clearly a result of improved tax administration. In fiscal year 2016/17, excise tax revenue on beer and tobacco grew 13.3 percent, while excise tax revenue on spirits grew by 22.7 percent. The KRA attributes this growth to enhanced compliance thanks to the EGMS. The IMF has also praised Kenya for the implementation of the EGMS. [...] The Georgia Revenue Service is currently satisfied with its performance. Georgia has managed to substantially decrease tax avoidance through various administrative measures. […] This project will, in the short run, be extremely useful in providing the tax administration with real, first-hand data on the production of the national tobacco industry, without the need for the taxable entity to make any declarations whatsoever. Once information for some time periods has been collected, it will then be possible to make projections of market behavior and trends that will be instrumental in generating a better understanding of the situation.